A Girl Scout Cookie Thin Mint cheesecake. 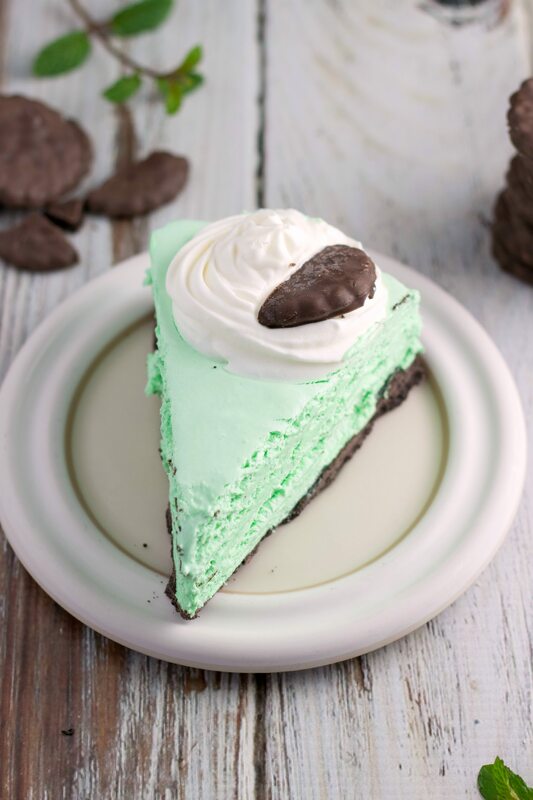 This cheesecake has a thin mint crust with a minty cheesecake and ice cream-like filling. Garnished with dollups of whipped cream and thin mint cookies. Happy Pi Day everyone! Or as I’d rather refer to it as PIE day. Math and I never really got a long. But if math will give me an excuse to eat pie, then we can be friends. For today. Only today. So technically this isn’t really a pie, it’s a cheesecake and a frozen one at that. But it has the same shape and look of a pie, so it works right? In college, I got a C in statistics. The only C I’ve ever gotten in my life. But that class made about ZERO sense to me. Negative sense to me if that is even possible. Then I meet my husband. Like a month after the class finished. Just guess what he got in statistics? A 98 percent. That’s just craziness. We needed to meet like one semester earlier. Maybe then math and I wouldn’t be such bad enemies. Speaking of the husband, he loves pi day. Because he loves math (he’s a smarty, mathy whiz) and his favorite dessert is pie. Of course we celebrate this holiday in our house. 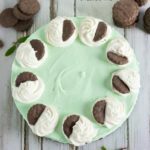 This dessert is incredibly easy and one of my favorite “pies.” I mean it has thin mint cookies; can you go wrong there? The filling is simple: cream cheese, sweetened condensed milk, whipped topping, peppermint extract, and green food coloring. That’s right; only 5 ingredients! And you can’t forget the garnish – whipped topping with little halvsies thin mints. Adorbs. If you want to substitute the whipped topping for whipping cream, that will work just make sure to have the right quantities (8 ounces of heavy whipping cream AFTER being whipped). I used a springform pan and haven’t tried this dessert in any other pan. I imagine a pie tin would work well, but it may be harder to serve this dessert and still have it “look pretty.” I don’t know though, you are probably more talented than me at neatly removing pie slices from a pie pan. Lightly spray a 9-inch springform pan with non-stick spray. Set aside. In a food processor or blender pulse the entire package of thin mint cookies until fine crumbs. Press the crumbs into the bottom of the pan. This will take a little bit of patience because but spread them evenly along the bottom, Press them down with the back of a spatula. In the same bowl (less dishes!) you used to make the crust, put in the cream cheese. Using hand mixers, mix the cream cheese for about 3-4 minutes or until very creamy. Slowly add in the sweetened condensed milk and continue to mix with the hand mixers for another 2-3 minutes. Using a spatula scrape down the sides and continue to mix for another minute. Mix in the peppermint extract and food coloring. Do as much food coloring as you want until you reach the desired color you want your cheesecake to be. With the spatula, fold in the cool whip until it is completely incorporated. Be careful to not overmix the cool whip with the rest of the ingredients. Serve directly from the freezer and return to the freezer as soon as you are finished serving. It is like ice cream and will melt easily and quickly! Optionally garnish by spraying dollups of whipped cream around the outside. Cut some thin mints in half with a knife and stick the cookies into the whipped cream. Umm….hello favorite recipe alert! 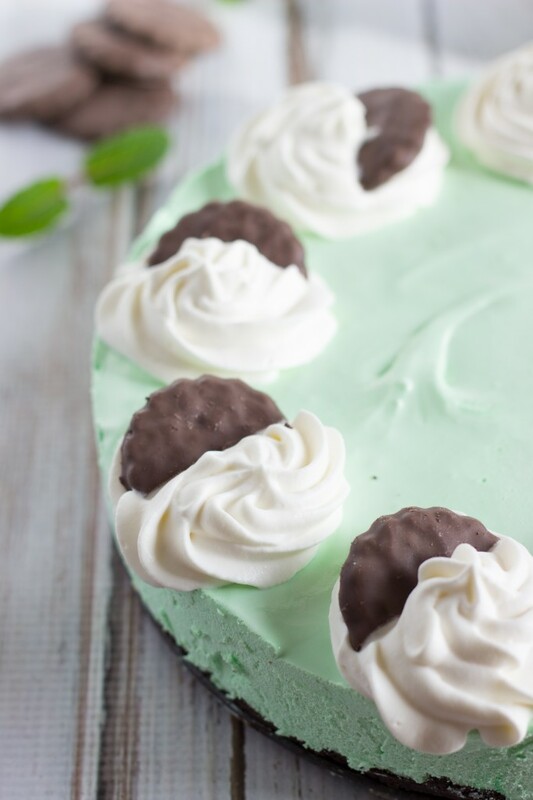 Thin mints are my life…and so is cheesecake. Love frozen cheesecakes since they are SO EASY. I wish I had heard about Pi day before yesterday…such a fun idea! Pinning! Haha!! Crack me up! Thanks for the pin Taylor! Hope you’ve had a great weekend so far! 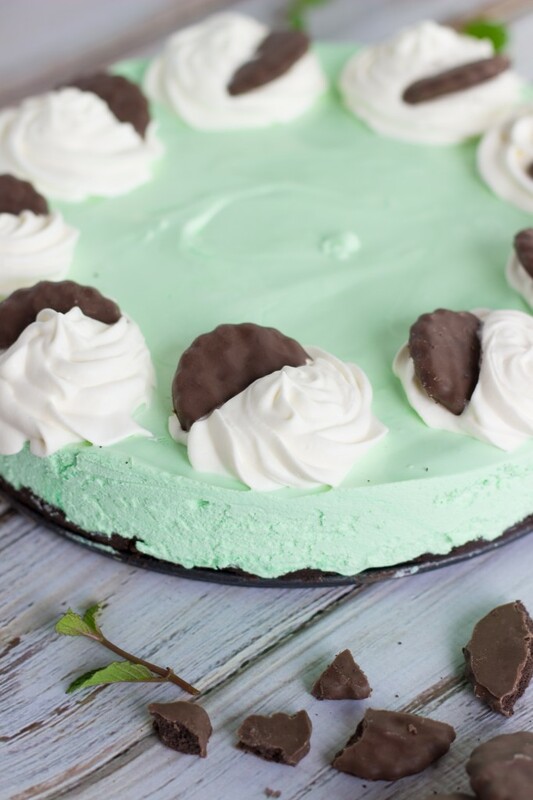 thin mint cheesecake! Sounds like the best thing ever and it’s so photogenic! This cheesecake looks and sounds amazing! Plus it’s perfect for St. Patty’s day and Pi day! Double win right there! haha Hope you have a great weekend friend! I want it for breakfast– right now! This is so cool! Looks like it goes together very easily too. My kind of dessert! I’ve never had frozen cheesecake before but I think one made with Thin Mints would be a good place to start. This is SO pretty, Chelsea!! The color is just perfect! I bet I could eat the Thin Mints crust all by itself, haha. But of course it would be so much better with a whole slice. Preferably a large one. 🙂 Love the whipped cream and Thin Mints on top! This is so pretty ! I love how springy it looks! Pinning! What is it with guys and being awesome at math? My fiance is the same way. Its fine…we’ll just win the kitchen over! Girl Scout Cookies + Cheesecake = win in a my book! Frozen cheesecake? yum! Frozen cheesecake with Oreos!? Double yum!! This frozen cheesecake looks amazing Chelsea! 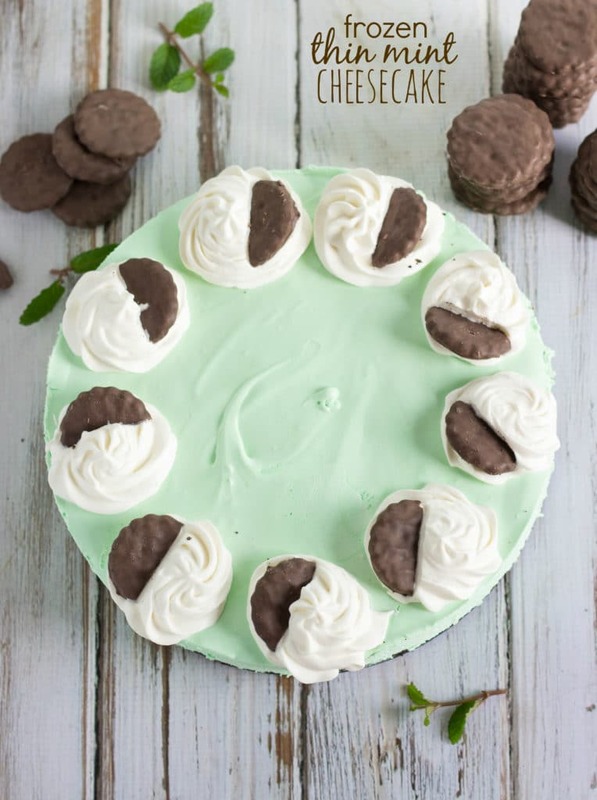 Love the thin mints crust and this is so perfect for St. Paddy’s day and Pi day! Love it! Ahh, what a wonderful frozen treat! I actually like eating frozen cheesecake! Well, in bite-size form. I know I would love this, since I`m thin mint obessed! This is absolutely gorgeous and perfect for those hot summer days (if they ever get here). Thanks again for sharing at Simple Supper Tuesday. Hi Dona! Glad to hear you liked the filling, but so sorry the crust didn’t work out like you were hoping. I’d love to help trouble-shoot it with you, but it’s hard to know what exactly went wrong so I’ll ask a few questions. Did you blend/food process the crumbs until they were super fine? If the cookies were even a little chunky that would cause a problem. Next, did you very firmly press the crust together? I used a hard object to really press the crumbs down and to get them to hold. Some other ideas – maybe the butter measurement was off a bit for your batch? Or you could just try using a little more butter in the crust. Another thing is it’s very important to grease the pan before laying down the cookie crumbs and then pressing them in very well. Hope this is helpful, please let me know if you have any other questions. Please try to post the amount of butter you used as soon as possible. I will be making this for a gathering at my house next Wednesday. Thanks! Ah I’m sorry Dona, I didn’t use butter in this recipe, I misread the post you were commenting on. When I ground up the thin mints they were so sticky on their own that after pressing them down hard they held perfectly for mine. But perhaps a few tablespoons of butter would help. I would recommend starting with 3 tablespoons and seeing how sticky your mixture is. I’m wondering if the stickiness of your cookies verses the ones I used are due to a brand difference. I used an off brand thin mint cookie package from Wal mart if that helps. Chelsea, Just want you to know that I did not give up on your recipe. Here it is over a year later, and I bought another box of Girl Scout Thin Mints and tried it again. I added three tablespoons of butter as you suggested, and it turned out great. I served it to a group of friends, and they said it was delicious. I might suggest that you add the butter to your original recipe. Thanks! Dona K.
I made this last night for a book club meeting tonight. I just tasted it– wowza! So rich and packed with flavor! Really great recipe. I’m sure my ladies will love it. 1. How much butter did you put into your crust? 2. Did you bake the crust? If so, for how long and at what temp? I would appreciate your help, since I will try to make it two days from now. Thanks! Dona K.
I really wAnt to make this cheesecake but I will be taking it to a function. What would happen and how would it taste if it thaws before serving? It will completely melt. It’s supposed to be a frozen cheesecake so basically like ice cream it has to be eaten out of the freezer and returned to the freezer after serving. Hope that helps!